AUSTRALIAN cattle exports recovered in 2018 to surpass one million head for the fourth time in the past five years. 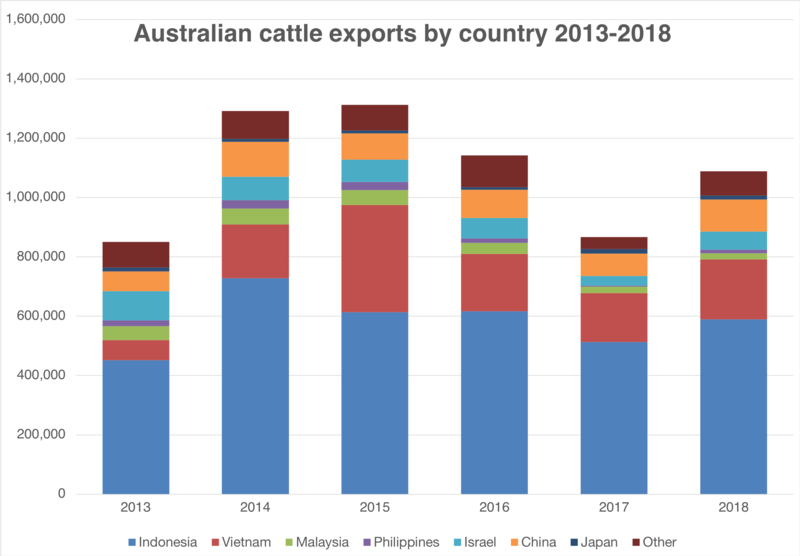 The year saw solid growth in exports to Australia’s the key Asian markets of Indonesia, Vietnam and China, a strong lift in exports to Israel, and the significant return of Russia, which imported no cattle at all the previous year. Overall cattle exports for the 2018 totalled 1,088,870 head, a strong 26 percent above the 867,056 cattle exported in 2017. China continued its emergence as a growing market for export slaughter cattle, taking 33,026 heavy cattle for the year (DAWR figures which include the Dec 24 shipment from Port Alma) a 355 percent increase fro the 7250 slaughter cattle imported the previous year. Israel, an important market for producers in northern WA, has also recorded substantial growth in the past year, increasing from 32,405 feeder cattle (predominantly young bulls) to 60,661 in 2018. The growth of of the market comes at a time though when the future of the market is facing uncertainty, with the Israeli Government currently considering to phase out the import of livestock, which has come under strong criticism in the country following the Awassi Express debacle last year. The cattle export market to Turkey, once a major Australian export destination, has returned with some strength in the past two years, importing 20,709 cattle in 2017 and a similar 19,260 last year. However, late last year the Turkish Government announced a halt on the import of live feeder cattle into Turkey from all countries. The suspension is believed to be driven by a combination of difficult economic conditions in Turkey, and accumulation of stocks in the country and a bid to protect domestic farmers. While there have been reports the halt is only temporary there is no clarity yet on when Turkey is planning to lift the ban. Increased export figures were also reflected in shipping activity from Australia’s major cattle ports, which saw shipments from Darwin increase by 30pc to 400,544 head, Townsville lift by 26pc to 257,513 cattle, Fremantle up 39pc to 145,214, Portland rise 89pc to 116,364, while Broome finished with 85,317 cattle, 11pc down on its 2017 figures. Turkey could continue its elimination on imports from Australia until its economic situation is better. In Turkey, as the international exchange shows A$1 ~ ₺3.7804, it’s difficult to expect Australian imports to enter into Turkey with such a higher-rate currency exchange rate. James, this is NOT a shot at you as I know that you can only report the numbers that are available to you BUT……we (the industry) must start reporting our exports in $ terms, NOT in volume. It is the same with meat. I am pleased to see that there is ‘some’ data now available for meat in value, but surely that is the only number that should matter. I hope that people like you can have some influence in this regard.